I have to admit straight away that these patties were born from both desperation and accident. Desperation, because it is zucchini time again. To anyone with a garden who has ever grown zucchini and planted more than ONE plant you know what I mean. I have three plants growing, a heap of zucchini at the moment, and more coming every day. Accident, because when trying to use them up I decided to make some Chinese style dumplings. Using the steamed zucchini dumplings at Shandong Mama as a model I put together a mix of grated zucchini, tofu, sesame oil, soy, coriander and spring onions and made up some dumplings. They were nice enough but not earth-shatteringly good like the real thing that Mama makes. Each dumpling only takes a teaspoon or two of filling, so I was left with a bowl full of mixture to use up, and frankly I couldn’t be bothered stuffing any more dumplings. They are ridiculously labour intensive for a novice and my failure rate is about 1 in 4. I think I will leave it to the experts. Anyway, as a result of my dumpling experimentation, I had a bowl of leftover mix and decide to use it for patties. 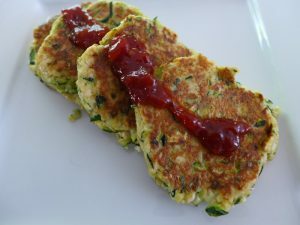 I added a bit of mung bean flour to firm it up and fried it up as patties. They were delicious. Delicately flavoured, golden brown on the outside, soft inside. I ate them with some chilli jam. Grate the zucchini coarsely into a large bowl, add the salt and mix. Leave for 10 minutes, squeeze the zucchini and pour off the liquid. This is just so they are not too wet. Crumble the tofu into small pieces into the bowl. Add all the other ingredients except the flour and mix. Add the flour 1 tablespoon at a time until the mixture holds together. You may not need it all. Fry the patties in a lightly oiled pan over medium heat until golden brown on both sides. It should take 5-7 minutes per side until the centre is cooked, so don't have the heat too high. When you say 3 medium, what sort of weight are you talking? My zucchinis are just small, a bit crowded at this stage to creep up into marrows at this stage. Do you think this recipe would also work as a zucchini slice? My medium ones were about 4-5cm across and 20-25 cm long. Not sure of the weight. But the recipe is forgiving. I I think it would work fine as a slice if you added more mung bean or chickpea flour to help set it. Yes Jeannie, not bad at all for an accident! A slice is a great idea! I was wondering if they would work as little balls baked in the oven. My frying always seems to result in undercooked or burnt. I loved the flavours. I think they would. Again I think you’d need more chickpea/mung bean flour. I think they’d also work fine baked as patties. So just spoon and flatten them onto a baking sheet in an oven at 180C. I know what you mean about burning or undercooking. The trick is patience. Heat the pan, drop the mixture in, turn the heat down low and wait. Flip and cook on low. Once they are solid, then you can turn the heat up to brown if need be.